Never a better time to boost bank capital. It is not often you will get this writer singing the praises of our bank regulator. But the recent discussion paper¹ released by APRA on how to increase capital to meet global standards for our major Australian banks, in our view, is not only spot on but could not come at a better time. Dialling up capital as the banks remain highly profitable is akin to taking out flood insurance during a drought. Easy to do and at a reasonable price. That said, the residential property storm clouds are slowly building. If they get worse, bank bond investors may start getting twitchy. This could expose our major banks’ Achilles heel – the high dependency on offshore finance – and risk a liquidity squeeze. That said, the more capital the less likely Australian banks and the overall economy risk capital flight. Collectively ANZ, CBA, NAB, and Westpac will need to raise their minimum capital ratios by around a third. To get to this level, rather than adopt what some foreign regulators have done, we believe APRA’s suggestion best suits Australia’s banking system. It is simply more of the same types of capital that are presently issued. As a result, our major banks will be safer and our investors less confused and more comforted by the straightforward solution. Post the 2007-8 financial crisis regulators around the world sought ways to shelter taxpayers from the risk of bailing out banks. This made sense. The regulators, though, were let off the leash and now we have acronym soup. The following CET1, AT1, Tier 3, CoCo, PONV, SNP, CRD, CRR, BRRD, MREL, TLAC, NCWO, SRMR, G-SIIs, D-SII, BHC, FHC are now all part of the global bank capital language. The range of regulatory outcomes leaves a highly inconsistent way of reducing bailout risk from country to country. Now, the global bank capital market is highly varied and complex. Comparing instruments across countries is increasingly difficult. The problem occurs when a bank is under financial pressure international investor confidence could be further undermined by the challenge of assessing the risk and the global relative value of its capital instrument. Australia’s major banks are highly dependent on wholesale finance to fund their loan books. The concern is wholesale or bond investors are usually the first to flee when financial stress looks to be nearing. The global history of banking crises suggests offshore bond investors are even more prone to flight risk. Australia’s major banks currently owe around $800b to institutional investors and around half ($400b) is to offshore investors. Collectively, Australia’s major banks need to refinance the annual bond maturities of around $100b. Most of this is senior debt. The last thing that any bank wants to endure is market doubt about their creditworthiness. Banks are built on investor trust. This allows them to lever their balance sheet 15 times their equity bases. Lose this trust and the path from capital adequacy to default can be a short one. Keeping international investors confident about the credit standing of our banks is of the utmost importance not only to the banks’ survival but the health of our economy. The ultimate bank risk comes when debt cannot be rolled over. APRA’s recommendation will help reduce the refinancing risk. It is simple and we believe investors are clear on how subordinated debt of the operating company can help shelter senior debt investors from a bank in financial distress. Given the combination of weakening residential property prices, record household debt levels and a fresh memory of the U.S. property debacle of 2006-9, now is a great time to be building a capital fortress for our major banks. 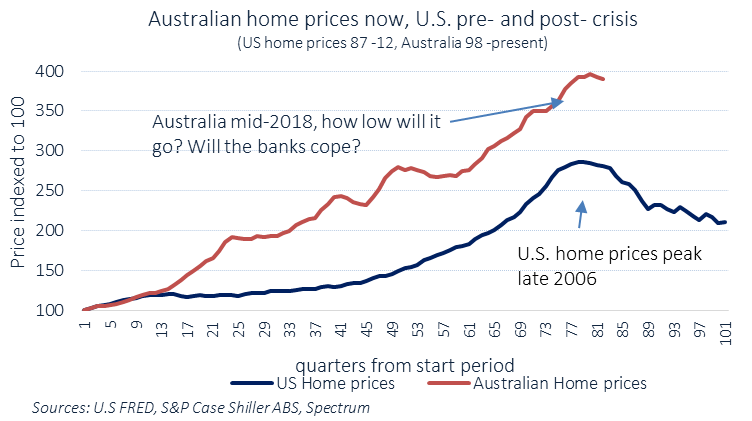 We believe if Australian property prices continue to fall, comparisons with the U.S will become more frequent. If that were to happen investor nervousness would rise. The larger the regulatory capital base, though, the greater the insurance against investors fleeing our major banks in a weak property market. The catch is the banks will have to pay more to fund their balance sheet to reach the proposed capital standards. Our calculation suggests their cost of funding will increase by around 3 basis points or 0.03%. This burden is moderate and likely to be shared among borrowers, depositors and, perhaps, shareholders. On our estimates, subordinated debt will need to increase in the order of $75b to meet the minimum required capital target over the next four years. Crudely, that is around an additional $5b per annum per big four bank. Australia’s major bank senior debt investors may benefit from improved capital ratios, perhaps win an upgrade on their AA- credit ratings and benefit from a little less supply. Senior debt of the big four banks totals around $800b. Hence, lopping $75b off this supply could have a modest impact on funding costs. Subordinated bond investors, though, face a relative deluge of issuance. Currently, the big four’s tier 2 capital is around $36b. While some of the new supply may go offshore, much will come to the local market. The listed market may be also be revisited to spread the issuance load. That said, the sheer volume of potential issuance hangs over the performance of the sub-sector². An ounce of prevention is supposedly better than a pound of cure. Should residential property prices in Australia continue to fall, fears of the inadequacy of a major bank’s capital could rise. Hence, the simple APRA proposal should reduce this risk. 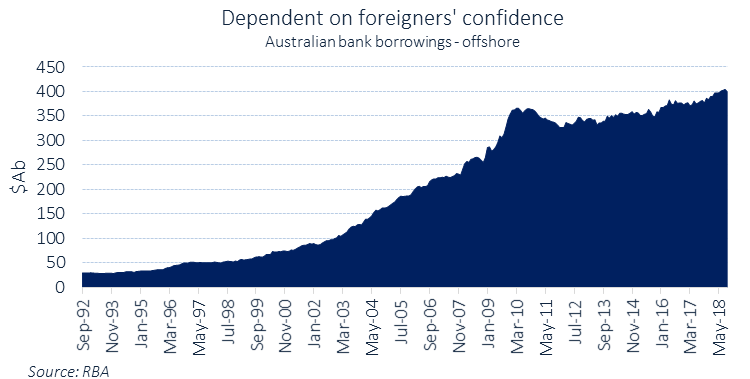 Despite the forthcoming increases in bank capital, this is not sufficient for us to change our underweight stance on Australian banks. The property tide is running out and risks putting greater investor doubt on bank credit risk. That and the excess supply risk in subordinated debt make the sector vulnerable to underperformance. ¹ APRA released a discussion paper on 8 November 2018. Its title is “Increasing the loss-absorbing capacity of ADIs to support orderly resolution”. The paper outlines APRA’s approach to loss-absorbing capacity to support an orderly resolution should an Australian deposit-taking institution encounter financial distress. In short, it is looking to increase capital. The targets will bring our banks into similar capital levels to what is planned in most developed banking markets. For our major banks, known as D-SIBs (domestic systemically important banks) the upshot is they will need to increase their capital by around a third in the next four years. The regulator expects most of this target to be met by subordinated debt or tier two capital. 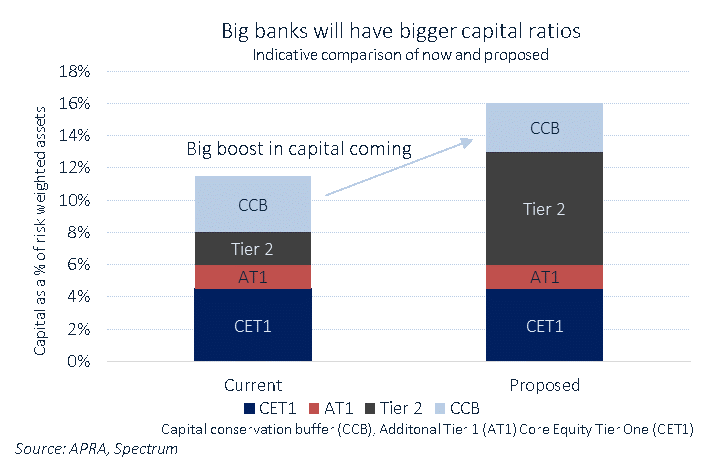 ²Possibly offsetting this, the banks will raise some of the additional required capital in the form of equity or AT1 capital. Another option is for the majors to push APRA to allow for the internationally emerging class of tier three debt or senior non-preferred debt to count as capital. In short, it is riskier than senior debt but safer than subordinated debt. And it is likely to be a cheaper way to build loss-absorbing capital. • (ABN 31 096 442 198, AFSL 225069). • It is for information purposes only and does not constitute or form part of, and should not be construed as, an offer, invitation or inducement to purchase or subscribe for any securities or funds nor shall it or any part of it form the basis of, or be relied upon in connection with, any contract or commitment whatsoever. It also does not constitute a recommendation regarding any securities or funds. • The information in this document has been obtained from sources believed to be reliable but no representation or warranty, express or implied, is given hereby as to the fairness, accuracy or completeness of the information or opinions contained herein. This presentation reflects the information available as of the date this presentation was prepared and is subject to change without notice to the recipient. • Past performance may not necessarily be repeated and is no guarantee or projection of future results. ← Bank greed and latent risks.